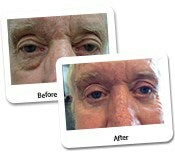 This gentleman had an upper and lower blepharoplasty and erbium laser resurfacing. 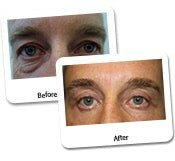 This is a 49-year-old man who underwent laser male blepharoplasty 4 months ago. 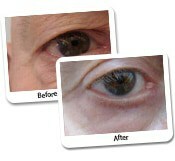 He highlights a number of interesting case-in issues in that he has a genetic tendency for aging around the eyes. I believe his parents and grandparents had the similar problem. He started to see the issues. As one gets older, sometimes this can affect the vision. As well as that, he has had a lot of sun exposure which is causing sun damage and wrinkling around his eyes. Because of the way he smiles, there is creasing of the skin. 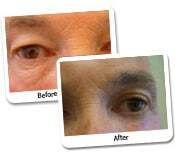 You can notice on the post-operative treatment, besides the fact that the bulging fat bags have gone, the wrinkles have been mostly removed due to the erbium resurfacing. He has always had a little bit of muscle relaxing injections to relax the muscles in this area so that the wrinkles do not recur. A lot of patients do research therapies and cosmetic options in great detail. This gentleman did this and spent a lot of time with other doctors and on the internet before making a decision to go for laser blepharoplasty. There is a lot of information on the internet and patients are often interested in what is the cost of the procedure. Besides knowing the cost of the procedure, one needs to understand that not all techniques are the same and there are different options. 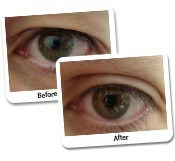 In this case, for this gentleman we used a CO2 laser and a contour erbium laser. Different factors drive people to have surgery. Some people have it to look younger and healthier. Others are going through divorce or some people just want to look more refreshed at work. Men are now commonly having surgery. One of the most interesting things which occurred in this gentleman and which occur in many people is that nobody has noticed. They say you look well; you look refreshed; you look happy. Nobody can actually put their finger on what has been the change. Cosmetic surgery that gives this result is probably the most ideal as it means that it is a natural result and is not looking fake or poor.View Eye Rejuvenation for Men Before & After Photos Above.